THE FILM PATROL: A pirate’s dozen: Best pirate films and film pirates for Talk Like a Pirate Day! A pirate’s dozen: Best pirate films and film pirates for Talk Like a Pirate Day! ARRRRRR!!! Avast, ye swabs! Heave to! Stow that bilge, lubber, or I’ll keelhaul ye! Beg pardon. It’s contagious, isn’t it? 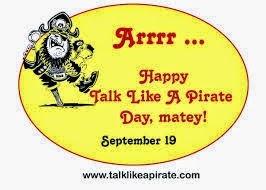 International Talk Like a Pirate Day is Sept. 19. It’s practically a religious holiday on our poop deck – a day when we’re up to our scuppers in flintlocks, cutlasses, eye patches and parrots. The best way to prepare is to go to the founders’ website: www.talklikeapirate.com. In 1995, John Baur (aka Ol’ Chumbucket) and Mark Summers (Cap’n Slappy) inaugurated the event, helpfully choosing the date as that of Summers’ ex-wife’s birthday, and the rest is historrrrry. Like other man-centric film genres, buccaneering flicks are good, violent, escapist fun, full of explosions, sea battles, sword fights, rum, women with lots of cleavage, incomprehensible jargon and treasure. Even a cursory search unearths more movies about these oceanic outlaws than you can shake a marlinspike at, if that’s your idea of a good time. The most staggeringly comprehensive guide to the subgenre is Rob Ossian’s humbly titled “Complete list of every Pirate Movie ever made” at his website, www.thepirateking.com. There are over 300 entries -- Rob, you are amazing. The Black Pirate (1926) Dir: Alan Parker. With Douglas Fairbanks, Sr., Billie Dove, Donald Crisp. Douglas Fairbanks, Sr. was the movies’ first big action/adventure star. He had already played Zorro, Robin Hood and the Thief of Baghdad by the time he filmed this silent costume epic in cumbersome, expensive two-strip Technicolor. It’s got the revenge-your-father plot, a damsel in distress, rip-roaring duels, derring-do and what-have-you. Find the restored version – the color is remarkably lifelike. Captain Blood (1935) Dir: Michael Curtiz. With Errol Flynn, Olivia de Havilland, Basil Rathbone, Lionel Atwill. This one made the careers of Flynn, de Havilland, Curtiz, and the score’s composer, Erich Wolfgang Korngold. Virtuous doctor becomes unjustly convicted slave becomes pirate. In gorgeous black and white, with stunning cinematography, a punchy script, great performances – and look sharp for former Olympian Jim Thorpe as a bilge rat. Look for the 119-minute version. The Sea Hawk (1940) Dir: Michael Curtiz. With Errol Flynn, Brenda Marshall, Flora Robson, Claude Rains, Henry Daniell, Alan Hale, Donald Crisp. Take the “Captain Blood” formula, double the budget, throw in Queen Elizabeth I and the Spanish Armada – bingo! An all-round classic, and close to the high-water mark for Warner Brothers Studio. The Black Swan (1942) Dir: Henry King. With Tyrone Power, Maureen O’Hara, Laird Cregar, Thomas Mitchell, George Sanders, Anthony Quinn, George Zucco. This one really doesn’t make a lot of sense. It’s a freebootin’, colorful free-for-all, with hero Power, Errol Flynn’s only real swashbuckling rival, and heroine O’Hara battle romantically whilst being captured, escaping, switching sides, grabbing booty, and so on. Cregar is stupendous as the nominally historical pirate kind Edward Morgan. Already the genre is beginning to get wise to its clichés. Deliciously over-the-top. Next, let’s take a closer look at the humor inherent in the subgenre. Pirate movies can be very good, and pirate movies can be very bad -- sometimes both at once. The Crimson Pirate (1952) Dir: Robert Siodmak. With Burt Lancaster, Nick Cravat. Siodmak was a genius film noir director (“Criss Cross,” “The Killers”), but when he got hold of the sober script for this swashbuckler, he rewrote it into a pretty good comedy. My mom loved this one – gee, is it because Burt runs around with his shirt off a lot? Look hard for a young Christopher Lee in a bit part. The Ice Pirates (1984) Dir: Stewart Raffill. With Robert Urich, Mary Crosby, Anjelica Huston, John Carradine, Ron Perlman. It’s an acquired taste – a glance at the cast list will show you how uneven it is. What’s more, it’s a sci-fi pirate film, directed by the guy who did the “Wilderness Family” movies and scripted by the guy who wrote “Krull.” But Urich, until his untimely death from cancer at age 55, and despite his tours of duty on “Vega$,” “Spenser: For Hire” and countless mediocre TV movies, was a very good comic actor. This is one of the few chances he got to prove it. The Crimson Permanent Assurance: (1983) Dir: Terry Gilliam. This little epic that opens Monty Python’s “Meaning of Life” is every downsized office worker’s dream come true – when a little firm is taken over by the Very Big Corporation of America, its employees go brigand and sail the streets in their office building, attacking their new masters’ skyscraper with file-cabinet cannons and ceiling-fan swords. Now let’s look at why actors love to play pirates – and who’s the best at the job. The explanation boils down to one word: OVERACTING. So many times, actors, especially film actors, are told to tone it down, rein it in, and keep it natural. Well, not when you’re playin’ a pirate, laddie! You can scowl and squint and saw at the air, drink so furiously that most of it spills down your shirtfront, leap and stagger and scheme and thrust and cackle . . . well, you get the picture. Still, it takes a special kind of ham to hit ALL the glorious notes on the pirate scale. Here are my four classic, if not classy, candidates for a prize worthy of the Spanish Main – Best Performance by a Pirate! Number Four: YOSEMITE SAM in Buccaneer Bunny (1948) Dir: Fritz Freleng. Poor Sam. Maybe it’s because he’s so short. He would be a happy little sociopath, you know, if it wasn’t for that long-eared galoot Bugs Bunny. “I’m a pirate, Sea-Goin’ Sam, the blood-thirstiest, shoot-‘em-first-iest, doggone worst-iest buccaneer that ever sailed the Spanish Main!” He persists, Sisyphus-like, in pursuing Bugs – getting blown up, catching anvils, getting crushed and boinging back into shape, ad infinitum. I salute his imperturbable suchness, his irascible idiocy. Number Two: JOHNNY DEPP in Pirates of the Caribbean: Curse of the Black Pearl (2003) Dir: Gore Verbinski. With Orlando Bloom, Keira Knightley, Geoffrey Rush, Jonathan Pryce. Hey, Orlando, I know you were ‘sposed to be the hero of this film, but Depp’s Jack Sparrow is simply one of film’s most memorable characters. Disney head Michael Eisner saw the rushes of Depp’s work. Proving William Goldman’s entertainment-business dictum “Nobody knows anything,” he cried out, “He’s ruining the film!” Instead, Depp created a billion-dollar franchise (yes, a fifth “Pirates” film is in the works.) Depp’s eccentric, witty turn sets the tone – one of Hollywood’s most conscientious actors improvises brilliantly. 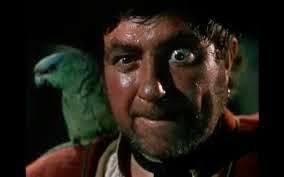 Number One: ROBERT NEWTON in Treasure Island (1950) Dir: Byron Haskin. With Bobby Driscoll, Finlay Currie. The Golden Galleon goes to Newton, who single-handedly created the enduring pirate stereotype. He was born to play Long John Silver. Newton was an intense actor who would overact at the drop of a hat, and he just cuts loose here, growling “arrrs” and “ayyees” willy-nilly as he goes. He went on to play Silver in two more films and a TV series, and took the role of Blackbeard to boot. An’ if you’re not fancyin’ me choices, then I’ll stuff ye with powder and blow ye to Davy Jones! Put that in your foc’sle and smoke it, bucko!